We recently moved to a more rural area, and OUT of a subdivision. Which is great because Goose has more room to play and we have more room for our dogs and a garden, and a few other animals. This year we added chickens to our list of pets, and they have the added benefit of providing us with eggs. This is “Mailman” and one of the hens. At about 6ish weeks. I had never had chickens, so I did a lot of research, and I knew that they would need an area to nest, and some bedding type stuff to make a nest out of. We went through A LOT of stuff to find things that they would like to nest and lay eggs in. They started out laying eggs beside out AC/Heating Unit. That worked until our unit died, and they didn’t like the repairman messing in their area. Next, they discovered that they could lay eggs in the tomato plants. That stopped when I started picking the tomatoes. Finally they decided to start laying eggs in their pen. Mostly in the grass clippings, but once the grass clippings would blow or wash away, they would go back to laying in random spots. So I decided to try some rabbit hay. “Mailman” and a hen at 8 months old. I found some timothy hay at rabbitholehay.com that they LOVE. I got a 1lb box to review, and it has held up to my crazy chickens. Now, the timothy hay that I got is meant for rabbits, and though I don’t have rabbits any more, I thought it was worth a try for the chickens. This is the rabbit I had for a very long time named Gerdie. I got the first cutting, which means the hay is a little more stiff and has more of the seed head things on it. If I still had my rabbit, this would be great for her teeth, and it would provide her with more nutrition than the 2nd or 3rd cutting. Overall, I am impressed with the quality of this hay. My chickens love it. I do wish I still had a rabbit so that the rabbit could try the hay out, too. If you have a rabbit or any other animal that would enjoy some timothy hay, The Rabbit Hole and I would like to give one you a pound of 1st cut timothy hay. All you have to do is fill out the form below to enter the contest. Christmas is on it’s way, and fast. I know this year I am completely unprepared, and I’ve only bought three gifts. To tell you the truth, it seems like everyone has so much that I don’t really know what to get them. I like to think outside the box, and get something that most people wouldn’t think about, and for kids, one thing I like to get for kids is stuff for school. Now that the school year is halfway over, it seems that, even though parents try to buy things that last, the beginning of the year school stuff is starting to wear out. Backpacks are always a big hit with Goose and my sister’s kids. Del Sol has come out with the cutest backpacks that I’ve seen in a LONG time. In true fashion to Del Sol, the backpack changes color when out in the sun too. Goose just loves that inside out of the sun, Minnie is black and white, but as soon as she goes outside, Minnie turns her normal colors, and she has secret designs hidden in the background that pop out as a surprise. Not only are Del Sol’s backpacks SUPER cute, but they are also very comfortable to carry. The shoulder straps, back, and handle are all padded, so that you don’t have to worry about the straps digging into your shoulders or the handle hurting your hand. Goose has been able to fit quite a bit in the Del Sol backpack. The backpack measures 15″ H x 12″ W x 4″ D. As far as pockets and compartments, the Del Sol definitely doesn’t have the most I’ve ever seen, but how many does my 4 year old really need? There is the main large compartment, an accessory pocket on the front, and two mesh pockets on the sides. She honestly doesn’t need more than that, and if she did, I have a feeling things would get lost. If Minnie Mouse is not your thing, they have Disney Princesses and a couple of Marvel characters that you can choose from. Overall, Goose and I love this backpack, and Del Sol would like to give you all a chance to win one!! You have until November 27th, 2015 at 11:59pm to enter. If you don’t want to enter the giveaway (or have arrived late )’: ) you can still follow Del Sol on the following social media sites. First of all, I need to wish Sophia a very happy “Gotcha Day”. Sophia has been with us for a year now, and I have to say that she has changed so much in that time. When Sophia came into our home, we right away had some issues that we knew we were going to have some trouble with. For one, she was not potty trained. Maltese are hard to potty train anyway, but Sophia had an addition problem; she was already 2 1/2 years old. Sophia was also very very afraid of grass and dirt. We right away knew that she was not going to be the one digging in the yard, but it also made it very challenging for potty training. It took Michael and I weeks of picking her up and placing her in the grass or gently leading her into the grass to get finally get Sophia to walk unassisted into the grass by herself. Another problem we had was, the previous owners I guess didn’t know what they were getting into when they bought Sophia, and the poor dog’s hair was matted down to her skin in places. Her first haircut I gave her, she was awesome. I had to cut the hair all the way down, and she never once complained. Over the past year, she has obviously overcome that fear of grass (dirt is a whole other issue), we are constantly working on getting her to pee and poo outside. She is doing so much better, but there are still days where she has accidents inside, so we have just learned to watch where we walk and the best ways to clean up the mess. I made a promise to Sophia after that first grooming, that I would never let her get that matted again. I try to completely shave her every three of four months, but in between that those total cuts, I use detangling shampoo. Recently, I’ve been using the Dancing Pet Best Groomer’s Pet Shampoo. It’s great for dogs that are prone to tangles and dry skin. Which is definitely Sophia. I love this shampoo because it’s an all Natural Formula – no harsh chemicals, there is no oatmeal to irritate – only a grain-free alternative to soothe, no alcohol to dry or damage skin, no tea tree oil to sting or leave greasy residue, no hydrocortisone to break down the skin, no toxic stuff like MEA’s or DEA’s, it’s eco-friendly, all plant-based naturally-derived ingredients, and the biggy Doesn’t Deactivate Topical Flea Treatments. I also love the the Dancing Pet shampoo because it leaves Sophia so soft, fluffy, and makes her hair super white. It also smells great. The shampoo has a very fruity smell, and deodorizes great, there was no “wet dog” smell after her baths. Overall, I love this shampoo, and I would recommend it to anyone who has a dog with long hair. If you are interested in purchasing a bottle for your dog, you can find it on Amazon here. You can also enter to win a bottle for yourself. You know, I LOVE my iPad Mini. It’s so convenient for Goose to play with, and has fueled my reading addiction. The only problem that I’ve had with the iPad mini is it hurting my hand and wrist after reading for about an hour, and Goose seems to have trouble holding onto it sometimes too. The ErgoGrip has become my iPad mini’s best friend. This little silicone rectangle has suction cups so that it sticks to your iPad or tablet giving you a more comfortable hold on the device. I love the ErgoGrip because it is so easy to put on my iPad mini and to take off, but there are so many awesome features. There are no adhesives, so you don’t have to worry about the ErgoGrip messing up your device. The silicone is very soft, so even if you are going to be on your tablet for hours, the ErgoGrip is going to make sure you are comfortable. They come in five different colors, so odds are, you could find one to fit your tastes. Also, the extra width of the ErgoGrip makes it easier for little hands to hold onto the tablet. There is only one thing that I don’t like, and that really isn’t any fault of the ErgoGrip. As you can see in the photo above, I have the ErgoGrip on the top of my iPad Mini (the short side). If I wanted to use it on the long sides, it would block part of the screen. So when using the ErgoGrip, I have to use my iPad mini in landscape mode. Not a big deal most of the time, though can be annoying. Like I said, this is not the fault of the ErgoGrip, it is, frankly, a drawback to the size of the iPad Mini. Overall, I am very pleased with my ErgoGrip, and plan to keep using for quite some time. If you would like to purchase your very own ErgoGrip, you can find them on Amazon. Right now, they are $8.99 (PRIME!!! ), so if you plan on getting one, I would head over to Amazon soon, and pick one up; the ErgoGrip is well worth the price. OK, I don’t know who wouldn’t like to get a beautiful piece of jewelry for Christmas. An Anastasia Ring would make anyone very very happy, and now, in this giveaway, you have the chance to try your hand a winning one in a size 8. These rings are BEAUTIFUL! Check out the review and Giveaway by Joan’s 5 Star Reviews below. Joan from Joan’s 5 Star Reviews is thrilled to share this awesome company and product with you! This time she received the Anastasia Ring to review and as always, she was not disappointed! The Diamond Nexus ring is so beautiful it is hard to put in words. Let’s just say Joan squealed with excitement when she opened her package! Cold and flu season is now upon us, and there is now a way to provide your child (both big and little) immune support and nasal support in an easy to take dietary supplement that just so happens to also be a popsicle. 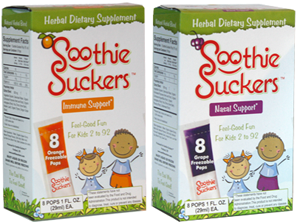 Each pre measured 1oz Soothie Sucker contains a nice blend of certified organic or wild-crafted herbal extracts, and vitamin A. The Soothie Suckers are great frozen if your little one has a scratchy throat or a stuffy nose. They can be tossed into a diaper bag or in a lunch bag and just taken like juice. OK, now that you’ve seen my pro’s on Soothie Suckers, here are my con’s… The taste is a little odd. It says that it’s orange on the package, but I didn’t think it tasted like orange, nor was it really an orange color. It looked and tasted more like herbal tea. Overall, the Soothie Suckers were pretty good, but I do believe they could improve on the flavor some to make it more appealing to the younger audience. If you would like to purchase some Soothie Suckers, you can do so on on their website or on Amazon. They come in two flavors; grape and orange. They will also run you around $10 for a pack of 8. If you would like to connect with Soothie Suckers, you can do so on the following websites and social medias: SoothieSuckers.com, Facebook, Twitter, and Linkedin. We are also very privileged to be giving away a box of Soothie Suckers. You can enter any time between now and 12/11/14 at 12:00 PM. If you are looking for a gift or a stocking stuffer for little girl or a woman who likes to have pretty nails, you should check out Jamberry Nails by Sara Anderson. There are literally HUNDREDS of options to choose from. You can do wild and crazy or simple and elegant. Jamberry even offers gift certificates if you don’t know which set would make the best gift. I personally LOVE the nail wraps because of their lack of chemicals. The ingredients are listed up front as Acrylates Copolymer. Which, according to the EWG, has been deemed safe. Sara Anderson has offered to giveaway one (1) sheet of nail wraps to one VERY lucky person. To enter to win, follow the steps in the widget below. You have from now until Dec8, 2014 at 11:59pm to enter. Winner will be chosen on 12/9/14. One thing I’ve always hated about putting my Christmas tree up is the work it takes to get the lights on. With a prelit tree, you don’t have to worry about doing all that work. And the best news, you can now enter to win one in this giveaway! Happy Entering!! The King Flock Christmas Tree, Freshly fallen snow blankets all the trees outside and by your fireplace a King Flock Tree brings the beauty of winter indoors. Recreate the magic of a snowy winter’s day with the King Flock’s realistic snow-powdered, flame retardant foliage. This high-end tree boasts heavily flocked tips of PVC with stainless steel cores that offer realistic presentation and require no additional shaping. A convenient hinged construction allows for easy setup of the King Flock. Wide to bottom, this high quality tree features a strong center pole of stainless steel as well as an included metal foot. Available in models from 5 to 9 feet in height, The King Flock Christmas Tree is offered in LED light, and unlit models, all with the snowy magic of Christmas Time. This giveaway is open to the Continental US only (because of shipping costs) and will end on December 2nd, 2014. Good Luck!! One of my favorite things to give for Christmas is candles, and Old Factory Candles are on the top of my “what to give’ list this year. I love these candles. They smell wonderful, and they are made out of clean burning soy wax. As soon as you take the lid off the candle, the smell is wonderful! The cranberry just brings back memories of family Thanksgivings, the Pumpkin Spice smells just like fresh baked pumpkin bread, the Autumn Leaves smells a lot like pine needles to me or more like Christmas. I personally love the cranberry the best, but if you are looking for something a little less “fallish” they have a whole list of sets, and I am sure you could find some scents that you love. Each wick should burn clean and even for over 20 hours making this an awesome long lasting Christmas or any holiday gift. Overall, I love these candles and the scent. If you would like to buy some of these for a special person in your life, you can purchase them on Amazon. They are prime eligible too, which is a HUGE plus in my book! You can also enter to win gift set of your own. You have from now until 12/01/2014 at 11:59pm to enter. Each day you can come back and gain more entries. Remember the more you enter the grater your chance of winning is! Share this photo on any social network, tag me (@babymarohn on most), and get more chances to win!!! Be the Star in Your Own Personalized Romance Novel!! Any couple can play the starring roles in these novels – as hero or heroine – how cool is that? With dozens of books and eBooks set in exotic locations around the world, there’s something for everyone (even vampire, detective, golf and historical fiction). Our authors blend action and romance to produce fun, campy books for a one-of-a-kind gift or keepsake. This would make a wonderful gift for couples who like to read together, or for a significant other who likes romance novels. Be sure to enter the giveaway daily for more chances to win! This giveaway is open to the Continental US only (because of shipping costs) and will end on November 27th, 2014. Good Luck! !